To generate a report about the cluster being monitored, click Help > Report at the top right menu of the OpsCenter interface. 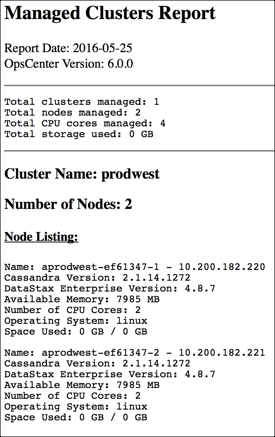 The report shows the version of OpsCenter, number of clusters and nodes being managed, total CPU cores being managed, total gigabytes of storage used, name of the cluster, and information about nodes in the cluster. You can print the report or save as a file format supported by your browser.